The lack of media criticality and depth – until of late – with respect to examining the issues surrounding Caledonia has left CANACE has 3.5 years of evidence and, literally, hundreds of stories to tell and lessons to learn from the terrible cost – in human and economic costs – of the crimes against democracy committed by the Ontario government during a concerted attempt to redefine the rule of law and diminish the Charter rights of non-native citizens for the purpose of appeasing aboriginal extremists. We have thousands of pages of documentary evidence including media articles & editorials; court transcripts; Crown submissions; legal decisions; Ipperwash-era documents and, of course, the various reports we ourselves have authored. Efforts are ongoing to make all of it available to the public for research purposes. CANACE does not necessarily endorse statements made or positions taken by founders in their personal websites. The links are provided for informational purposes only. This page is under continual construction. Thanks. Contact: Gary McHale, 289.286.0423 info@canace.ca. What is the legal authority for a provincial government to diminish federal Charter rights, and protection under its own Police Services Act during a land claim dispute? Why was the Ontario government allowed to interfere with the policing contract between the OPP and Haldimand County by engaging David Peterson to negotiate the surrender of Sixth Line policing to appease criminals who had attacked the town? If conditions in Caledonia were so bad as to require a ‘peacekeeping’ mission instead of police protection mandated by the Police Services Act why did Monty Kwinter promise native extremists in writing at the height of the violence on May 03/06 that he would not call in the military to protect Caledonians immediately after OPP officers were attacked by on April 20/06 attempting to enforce a court order? What was the legal authority for the government to negotiate an agreement with a gang that has attacked a community whereby the gang is permitted to determine the racial makeup of a police force in that (non-reserve) community? What was the legal authority for the OPP to ignore a Supreme Court decision (Ramsden v. Peterborough, 1993) by suspending the right of non-native citizens to place a Canadian flag on public utility poles near the occupation site from Dec 02/06 until July 12/10 as an alternative to protecting the rights of non-natives from – (as they informed the OHRC) – a native “extreme element” who might wish to harm them? What is the authority for police to arrest potential victims of crime (four people in total) instead of protecting their Charter rights from the threats of violent criminals? 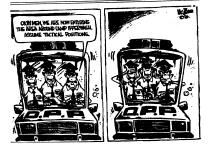 Why were the OPP’s so-called “best practices'”(as the Commissioner of the Ipperwash Inquiry described them) ripping Caledonia apart; traumatizing thousands of people; and taking areas of Ontario so close to the brink of anarchy that one reporter with the Simcoe Reformer did warn that the government “will have a “militia movement” to contend with along with growing native unrest”? Why is the McGuinty government and the OPP repeatedly justifying their handling of Caledonia using an inquiry that, despite being in session during the worst of the violence in Caledonia, never allowed the issue of violence against residents to be explored, and never made a single recommendation to prevent such violence? 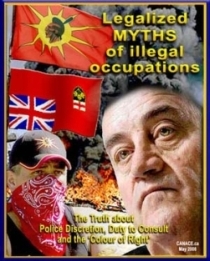 Did OPP Commissioner Julian Fantino have any evidence whatsoever to support his and the OPPA’s public pronouncements that non-native activists Gary McHale and Mark Vandermaas were engaged in or had an “agenda” of promoting, inciting or committing acts of violence? 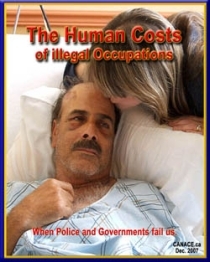 What legal authority permits OPP officers to simply refuse to protect the property rights of victims of illegal occupations in Cayuga and Hagersville without a court order? Were OPP officers indeed under orders to identify the race of lawbreakers and conduct themselves differently whether the person of interest was native or non-native as residents, activists and the Mayor of Haldimand claimed? Brown-Chatwell trial [awaiting funds to purchase Brown-Chatwell trial transcripts. See [INFO] [INFO]). [Fantino reference letter for native man re assault Gary McHale, PDF, 1 page]. There is no room for doubt. These cases concisely, yet thoroughly, examine – in the context of the Caledonia crisis as it has unfolded – critical issues such as: rule of law vs. aboriginal rights; Six Nations land claims; the Nanfan Treaty; OPP refusal to remove occupiers; etc. There is no lawful justification for the McGuinty/OPP argument that non-native rights may be subordinated or otherwise diminished during an aboriginal land claim, or that innocent property owners must suffer the extortion, intimidation and mischief that characterizes illegal occupations without recourse. Non-natives are entitled to the fullest protection under the Charter, the Police Services Act and the Criminal Code. 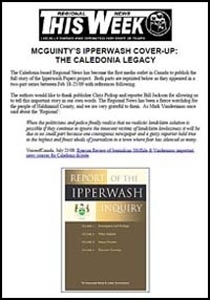 When you take time to read these rulings you will come to understand that the terrible events in Caledonia – and Ipperwash before – are not ‘mere’ fraud – they are nothing less than crimes against democracy committed by a knowing, wilful government in order to appease extremists for political ends. That these crimes were able to be hidden in plain sight simply by labelling them as ‘peacekeeping’ is an insult to every journalist, politician, lawyer and civil rights organization that either failed to recognize the dangers or chose to remain silent. Media coverage & docs for FantinoGate (criminal charge vs. OPP Commissioner Julian Fantino). See also LINK. Gary McHale Election Website (rec’d 10% of total votes as independent candidate in 2008 Federal election – 1,822 in Caledonia, pop. 10,000 ). July 12/09: The end of the beginning! CANACE successfully raises a flag across from the DCE occupation site. 1. What really has been happening in Caledonia? The most explosive of the events in Caledonia can be seen in the awful photos, and the intimidation continues unabated to this day. Attempted murder of a builder. 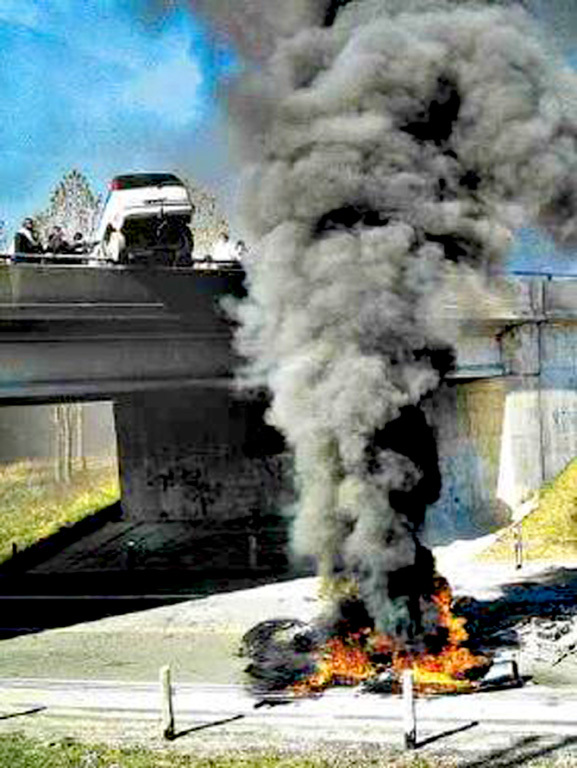 Attacks on police with no arrests or charges against the native thugs responsible. Violence against non-natives protesting at an illegal smokeshack in front of police without arrests even as the attacks continue. Peaceful non-natives sent to hospital – victims publicly blamed by OPP commissioner who orders his officers to target a non-native activist for charges before police investigation is even begun. Native smokeshackers fabricate false assault allegations. Illegal occupations of development sites protected by OPP officers in what the Court says are abuses of police power and discretion. OPP officers assist native protesters to build barricade to keep legal owner out of property and have charges of Mischief certified against them via private prosecution – charges dropped by Crown. Charges of Extortion and Intimidation laid against native protesters – charges dropped by Crown. Mischief. Threats of further road blockades. Charges against natives dropped by Crown while non-natives are prosecuted for the most minor of offences. Illegal smokeshacks selling cigarettes to the town’s children. Placement of smokeshacks on private peoperty. Threats against non-natives to force the OPP to deny them their right to protest near their occupation site. Brutal arrest of resident walking quietly down the road with a Canadian flag. Commissioner of the OPP intervenes to ensure Assault Police charge is dropped against violent native ringleader, then writes reference letter for him to aid in obtaining a reduced sentence for his assault on a non-native activist. False accusations against non-native protesters by native protesters and OPP officers. It goes on and on and on. NOTE: Every statement above is supported by documentary and video evidence as well as court evidence. [If you click on the photo of the man throwing the pallet off the bridge onto the roadway below you will see what appears to be an OPP police car on the far side of the bridge. You do not need to click on the photo of the main road through Caledonia being dug up to see all the police cruisers. 2. Does CANACE ‘provoke’ violence? 3. Is the struggle against Race Based Policing about racism towards native people? It is a source of bewilderment to CANACE how one can be accused of being racist for speaking out to defend the rule of law; equality before the law; the Charter of Rights and the decisions of the Supreme Court of Canada, and for the native victims of the same policing policings against which we oppose. Unfortunately, false accusations of racism happen regularly to people who speak out against the use of violence, crime and intimidation during land claims. The authors of Donner Book Prize finalist ‘Disrobing the Aboriginal Industry‘ have also been attacked as racists. The following links will help you decide if CANACE is motivated by racism. “I believe, however, that it is a critical mistake of both our government, the Inquiry and the OPP to assume that violent criminal factions speak for native people, and to ‘negotiate’ with them as if they do. It is an insult to every honourable, law-abiding, peace-loving native person in Canada. OPP Two Tier Justice policies are based on the false premise that native people have no self-control, that they are incapable of obeying the law,t hat they and their children are willing to live in a lawless world ruled by criminals who take what they want, when they want. For more than 15 years the OPP has been sacrificing the well-being of law-abiding people – both native and non-native – for the benefit of sociopaths and demagogues. 4. Why are we prepared to go to jail for a Canadian flag? Why are Canadians prepared to go to jail for this cause? What price would you put on the Rule of Law, and the right to be treated equally before that law? Our freedom is such an insignificant price to pay if we can hasten the day when the Rule of Law is no longer a topic for debate. 5. What do you see as ‘The Solution’? The only solution possible to bringing about true healing and reconciliation must be based on the recognition by all parties that no one is above the law, that all human beings are equal before the law, and that victimizing innocents is not the means of pursuing one’s grievances. Continuing down the road of appeasing or tolerating racial policing and violent native groups can never provide a true solution. We believe that meaningful healing and reconciliation can be best begun with an apology from the OPP for conducting racial policing; one from the Ontario government for allowing it; and one from Six Nations for its role in supporting the extremists who attacked Caledonia’s people and infrastructure. Jan 08/10: Justice of the Peace Brown issues summons [PDF, REPRINT] for Fantino to appear at the Cayuga Courthouse at 1000 on Feb 03/10 to answer charge of Influencing Muncipal Official . See also: LINK, LINK, LINK, LINK. 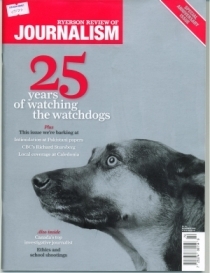 Jan 08/10: Globe & Mail’s Christie Blatchford becomes first journalist (outside Caledonia) to effectively clear CANACE co-founder Gary McHale’s name of Fantino’s attempts to smear him as an inciter of violence and target him for arrest. In ‘Activist a nagging thorn in Fantino’s side‘ [PDF, REPRINT] she says: “As for Mr. McHale, despite Mr. Fantino’s clear efforts, as documented in emails and court transcripts, to “take him out” – that is, have him charged with something, anything – the only crime the OPP with is the novel “counselling mischief not committed. A date for the resumption of the preliminary hearing on that charge has yet to be set. Mr. McHale, as he almost always does, will represent himself – a portly, bespectacled fellow who is nonetheless proving a spirited and sharp combatant.“The effect was immediate and satisfying in that reporters suddenly began treating McHale and CANACE with new respect and listening to what he/we had to say. Blatchford, in one fell swoop, single-handedly smashed down the wall of suspicion in the minds of the Canadian media that Fantino had erected in his unsuccessful attempt to silence us. Her article is also the first to report on the political influence brought to bear on Caledonia resident and Hamilton Police Service officer Dave Hartless by Ontario Senior Negotiator John Nolan when he used the OPP to try to silence him. Jan 05/10: Christie Blatchford of Globe & Mail becomes first journalist (outside Caledonia) to tell part of the tragic story of Chris and Myron Dudych [PDF, REPRINT] who live on the Sixth Line in Caledonia without OPP policing. They also happen to be parents of Pam Dudych – otherwise known as ‘Dancer,’ the courageous 14 year old girl who spoke out for the children on her road at a time when most in Caledonia were too frightened to do so. Dec 31/09: McHale v. Attorney General of Ontario, 2009 – Superior Court grants Gary McHale application for Mandamus ordering that a justice of the peace issue process for a charge under s.132(2) of Criminal Code (Influencing or Attempting to Influence Municipal Official) vs. OPP Commissioner Julian Fantino in connection with an email he sent to Haldimand Council on April 07/07. See also: LINK. Dec 31/09: Brown-Chatwell Caledonia lawsuit settled mid-trial. See also: LINK. Nov 09/09: $7M Brown/Chatwell trial begins. Admissions from senior OPP officers that they failed to enforce the law against native protesters and knew it was wrong. Heartwrenching testimony from victims Dave Brown and Dana Chatwell. Click here for key testimony excerpts from media coverage. July 12/09: The end of the beginning! After 4 arrests and a 31 month campaign, the battle to force the OPP to stop violating the right of non-natives to place Canadian flags on hydro poles near a Caledonia occupation site ends in victory. 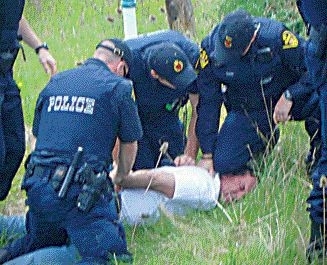 July 09/09: First arrest of illegal smokeshack operator in Caledonia – after CANACE sends warning to OPP. July 02/09: : McHale v. R., 2009 – Court overules Crown’s decision to stop private prosecution of government officials by preventing evidence from being heard by Justice of the Peace. Together w/Parkinson v. R., 2009 CANACE founders have now defined the limits of Crown authority during private prosecutions. Justice Marshall highlighted importance of issues raised by quoting from Alexander Hamilton, a father of the U.S. Constitution. Currently under appeal by Crown as of Dec 05/09. Oct 15/08: CANACE Executive Director wins 10% of the votes in federal election in riding of Haldimand-Norfolk. 1822 votes of the 4,821 votes came from Caledonia, with a total population of approximately 10,000. 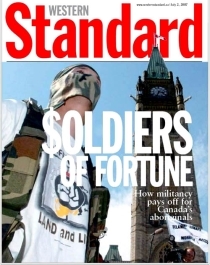 Jan 20/07: OPP call in London riot squad and helicopter to prevent non-natives from raising Canadian flag. 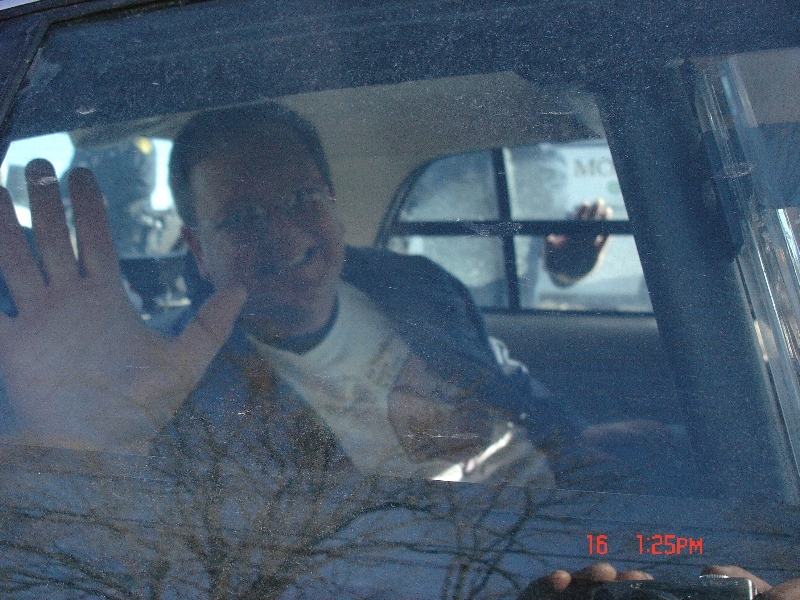 Dec 16/06: Arrest of Gary McHale & Mark Vandermaas at flag raising protest. Dec 02/06: Arrest of Caledonia resident Bo Chausse while attempting to place a Canadian flag on a utility pole across from the occupied Douglas Creek Estates.